What They Say | Evil Lies Within. How Long Will It Stay There? What They Say now avaliable on DVD! Multi awarding indie film ‘What They Say’ starring Heather Dorff and Kelsey Zukowski is now available on DVD! Get you DVD today! Send paypal payment to heatherdorff@gmail.com! Award winning short film What They Say is available for digital download purchase! Support the indie film industry and the amazing cast and crew behind this project by buying your official copy today! Click ‘buy now’! Digital Download + Poster + Signed photo for $32 with free s & h in the US and add $5 surcharge for international shipping! Contact Heather Dorff today for a bundle package or for money order payment options! WTS recently screened at the 2012 Fright Night Film Festival and was well received, the team has submitted the film to many varying critics for review, and are still in queue and waiting to hear from 5 additional festivals we have submitted to. All in all the festival run should be complete by the end of this year at which point we will begin the distribution process! WTS recently screened at the 2012 ‘Blood on the Beach Festival’ in VA and Yuma Film Festival in AZ. Took home ‘Best Female Performance – Heather Dorff; at the Yuma Film Festival. Took home ‘Best Short’ and ‘Best Actress – Heather Dorff” at The Critic’s Word 2012 C.H.E.W.I.E. awards. This brings the total to 8 award wins for the short and 8 nominations thus far in it’s festival circuit. Fright Night Film Festival, Louisville, KY last week in June. What They Say won Best Director and Best Editing at the 2012 Indie Horror Film Fest! That marks 5 wins and 8 noms in total so far for the short. Stay tuned on updates when we find out if we made it into recently submitted fests. There is much more in store for this film so keep your eyes peeled for special announcements. WTS will be screening March 24th, at 7:30 PM, at Portage Theater as part of the 2012 Indie Horror Film Festival. Various cast and crew, including Heather Dorff and Kelsey Zukowski, will be in attendance. Buy your tickets and learn more about the fest by clicking here. New extended teaser trailer with ‘sneak peak’ coming soon! Welcome to the official website for the short film ‘What They Say.” Here you can find all the information on production, casting, auditions, getting involved, and much much more. WTS has been selected to screen at both the 2012 Stiletto Film fest in Boston end of February and the Indie Horror Film fest in Chicago end of March. This marks the 4th and 5th festivals that WTS has been accepted to. We should be hearing back from the numerous festivals we submitted to in Nov/Dec sometime end of Feb – April; so stay tuned for hopefully more good news! Check out our very first official film critic review by Clifford Kiyabu at TCW Reviews. We are submitting to the Cleveland International Film Festival today! Stay tuned for general updates and additional reviews and submission information. Interested in screening WTS and reviewing it on your site? Email us your info and request. Please include your review website’s URL link and full contact details in your inquiry. The final cut of What They Say is being release to cast/crew for private screening over the next 48 hours. Please view the FB fan page for more details. This is your one and only chance to view without attending festival premieres over the next year! Do not miss out! We begin the mass festival submitting process on the 28th. Festivals we have in mind include Cannes, Cleveland Int Film Fest, Stiletto film fest, Prairie State and Indy Horror film fests in IL, and Viscera Film Festival among many others. Stay tuned for more info! Are you press/media that would like to screen WTS and write a review in your publication? Please email Heather Dorff for access and approval! Have a film fest you would like WTS submitted to? Please email Heather Dorff with your festivals details! Withoutabox and online submissions preferred. We want to thank everyone who made it out to our world premiere at the Chicago Horror Film Festival on Sunday. WTS was received well and lead actress Heather Dorff took home the ‘Best Actress’ award. Special thanks to Spook Show Entertainment and Willy Adkins for having us out. There is still some work to be done on sound and music for our film before we will consider it complete. We hope to have the final version ready to go within the next few weeks – at which time we will be sending out copies for reviews and starting to submit to festivals nation wide. If you are interested in reviewing our film on your site or publication please email us. DVD’s will not be available until after our festival run due to strict fest rules – which will be at least 6 months. WTS was nominated for ‘Best Short Film’ and ‘Best Actress’ – Heather Dorff at the 2011 Chicago Horror Film Festival where we are set to premiere on Sept 25th at 7pm. If you haven’t already, purchase your tickets here and use discount code WHATTHEYSAY for great deals on both day and full weekend passes to the fest. The post edit process is going very well and we are currently looking for artists looking to submit their music to be featured in the film. If interested please email us right away with the MP3 file. Deadline for music submissions is Sept 11th. Please no ‘live’ music. Check out our Indiegogo campaign for great perks and prop giveaways for those still looking to get involved as crew in the film, including: signed posters, dvds, invite to the premiere, producer credit, and more. You can also find our newest teaser and soon full length trailer there! Check out our new teaser and find out how you can get involved with this up and coming dark thriller here! IMDB and on-Screen credit, prop giveaways, posters, autographs, invites to the premiere, and more being offered on our indiegogo. The new official teaser trailer for WTS is now up on Geektyrant.com! Special thanks to Radek Michalik for making such an amazing teaser and Brian Shirley for posting the article! Please check out the article, share the link, ‘like’ the fanpage, teaser, and article and help support this Chicago short dark thriller! We are well into post production. The rough cut is long complete and Radek is hard at work on editing and special effects. Robert Iwataki is working on the official full length trailer which should be out in a few weeks! Stay tuned! Important notice: If you were an official extra in What They Say – please contact whattheysayfilm@gmail.com right away to recieve your IMDB credit. Deadline is August 15th for credits so please do so right away. The official ‘rough cut’ of the film is complete. We are set to have a trailer complete by early august. VO work still needs to be complete but we are well on the way. Stay tuned and continue to help support indie, Chicago artists, and our film by spreading the word. Don’t forget we premiere Sept 25th at the 2011 Chicago Horror Film festival. We are now officially on IMDB! Check out the page here. Credits and updates are still being made so hang tight. All on set photography photos have been added to the site. View them here. Post production indie gogo, official stills, new teaser, and more coming soon. Please ‘like’ us on FB and on our IMDB! Follow us on Twitter. Show support for local low budget indie films. Stay tuned. We are two days away from officially being in post production. Set stills and candid shots are now in the photos section of the site. Post production Indiegogo with a few really cool prop give aways are soon to come. Merchandise information, including signed posters, coming soon. New teaser and trailer will also be popping up in the coming months. Please keep checking in with What They Say’s youtube account to keep up to date with any new media including ‘sneak peaks’. Stay tuned for more updates and post production announcements. Filming over the 14th/15th went amazing. We had to deal with the rain – but such is life sometimes with filming. Special thanks again to everyone who came out as extras, the cast, and crew for doing such an amazing job thus far. Last weekend of filming is coming upon us. Good luck to everyone involved and we look forward to seeing you. Check out our teaser if you haven’t already and go ‘like’ our page on FB. Please continue to support the film and spread the word! Indiegogo post-pro, new trailer, and behind the scenes photos soon to come. Stay tuned. First 2 days of production are complete and went very smoothly. We are well on our way to shoot day 3 this Sat. Emails have gone out to those who previously mentioned being interested in playing extras. IMDB ‘extra’ credit, food on set, and digital copy of film are being offered to those interested in participating. Call time will be between 7am – 8am Sat in Elgin on May 14th and is set to end no later than 3pm due to the location being booked after that time. Extra’s must also be available same times on the 15th in case of bad weather. Must have spring dress clothes to be part of the scene. There are only 12 more ‘extra’ slots available so please contact us asap to RSVP your spot if interested. We are less than 24 hours away from officially beginning production of WTS. It has been an adventure thus far and the cast and crew are excited to begin the next step in the journey. Last segment of the behind the scenes interviews will be posted tonight. We are looking for a limited number of extra’s able to get to Elgin on May 14th and possible 15th depending on weather. IMDB credit and food will be provided. Location and wardrobe info TBA soon. If you are interested please contact us asap as there is only a limited number of available slots. Soon to come: behind the scenes and stills from production. In the meantime please watch out teaser and help spread the word about our film! Second ‘behind the scenes’ interview segment is now posted in the Media section. We are tying up last loose ends in pre-production. Extra casting information will be going out within the next few weeks, so, if you haven’t submitted your head shot for an extra role and are interested please do so now. All extra roles will recieve screen/IMDB credit and copy of the film once it is out of festivals. The first of three ‘behind the scenes’ interview segments for the film has been posted in the Media section. The first interview features Heather Dorff, Kelsey Zukowski, and Nicole Klemens talking about The Story. We also welcome Travis Legge and Jason ssg to the official crew of WTS. Travis will be the Until Production Manager and Jason will be handling on set and post sound work. We are still looking for MUA/Hair Stylist and Production Assistants. Final cast has been selected and pictures posted in the cast gallery. We are no longer accepting head shots for any roles. We are still in need of on set and post sound as well as production assistants as well as other various crew positions. If you are interested email your resume here. We will be in need of extras dressed in spring wear on May 14th for an outdoor socialite/upper class party scene. We will be posting an official announcement for extras around May 1st – IMDB extra credit will be included. What They Say’s auditions and ‘Bad Movie Night’ events went really well. We are no longer casting or accepting actor submissions. Final casting announcements will be up by the end of the week. We are still in need of post sound and on set sound recording. If you are interested and have your own equipment, please contact us to learn more. We are also looking for production assistants to be on set during filming as well as a few other various crew slots. Please check out our crew page for a full listing of open positions. Bad Movie Night to Help Fund What They Say is this Friday and Sat in Wicker Park, Chicago. 10 dollars gets you admission, previews of local indie projects including the ‘extended’ length trailer to WTS, chance to win a signed WTS poster, raffle each night for weekend passes good for 2 people to The Chicago Horror Film Festival 2011 – where WTS is set to have it’s official worldwide premiere, meet local film professionals, free snacks, drinks being offered, watch 2 films, and have a good time while helping WTS reach it’s budget goals! Check out our events page or the official FB event page to RSVP today. Very limited seating left. Tickets sold at door or through paypal – first come first serve. Please review our Auditions and Breakdowns pages for further information as to open roles, what to have prepared, character wardrobe, and more. Please only come to the auditions if you meet one of the open role requirements. Latest press article on TCW Reviews with a new casting announcement and official public release of our new poster here. Cast and Crew additions, audition dates, events, and breakdowns all updated. We are extremely excited to announce that What They Say received a $1500 investor contribution and we welcome two new executive producers to the film. We have met our minimum budget goals. Now we are looking for additional funding to improve upon our project: allow for better a special effects budget, a decent wardrobe budget, better equipment rentals including renting the Red1 camera for a few slow motion scenes, festival/marketing/promotion budgeting, among other expenses and improvements. Please help take our film to the next level and contribute through our indiegogo today. The cast and crew of What They Say are hosting two ‘Bad Movie Night” events to help fund the film! Those attending will get: two movie screenings, drinks, free snacks/popcorn, a chance to get a signed copy of the official WTS poster, and a viewing of the official unreleased version of the extended trailer for What They Say! Click here to learn more about the event and help support the film! Casting updates/additions posted. Additional indiegogo donation perks have been updated – including the addition of the ending scene featured extra role. 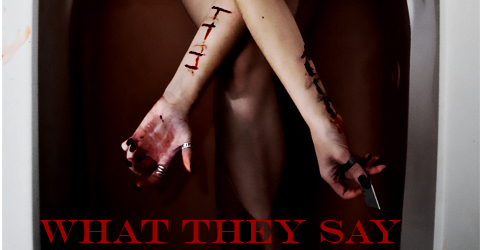 What They Say’s extended length teaser trailer will premiere in Chicago on March 15th at Cell Block Splatterfest. Admission is free! Stay tuned forthe release of Behind the Scenes interviews featuring Nicole Klemens, Heather Dorff, Kelsey Zukowski, Robert Iwataki, and Radek Michalik. We are offering great pre-production incentives! Grab your perk while they are still being offered! Audition updates coming next week. Auditions went extremely well. We are no longer auditioning for the roles of Young Gwen or Grace. We also have two very strong possibilities for the Father role. We plan to hold additional auditions – hopefully the first weekend of March. Please stay tuned and continue to check your email and this site for updates. These March auditions will include the roles Emma, Brooke, Sophie, and Amber. They will be first come first serve on slot reservation and there will be an over abundance of emails sent out as we have 80 head shots just for those roles. Please respond with urgency when you receive the audition reservation email. What They Say’s official extended length teaser trailer will premiere today at the Raymond Did it world premiere along with Afraid of Sunrise’s official full length trailer in Rockford! Do not miss your chance to see both trailers, meet some of the cast and crew from both films, and see the much anticipated Raymond Did It. If you haven’t purchased one already, tickets may still be available at the door. First priority main cast audition information scheduled for this weekend have been sent out. Please check your email for audition time slot scheduling information. If you did not receive a email – please hang tight as we are planning to send out addition emails in the next two days. If you have submitted and are not contacted by this Wednesday: please keep checking the website for future audition updates as there will be more auditions scheduled in the near future. As of right now we have 41 strong candidate submissions and another 50 possibles for the main roles & female/male speaking roles/extras. Auditions will begin soon and continue on until we fill all cast slots. Auditions will be conducted in Chicago on a mixture of weeknights and weekends. Those who strongest match our role requirements will get the highest priority for audition slots. There will be one or two “open casting” call days for those that didn’t quite meet the high priority list. Please keep checking in for additional updates and information on what will be required at the auditions. The official teaser trailer for What They Say has gone live! Brian Shirley at Geektyrant.com posted an amazing article along with our press release. Special thanks to him for continuing to support What They Say! Check out the article and teaser trailer here. Official trailer to premiere tomorrow on geektyrant.com! Donation sites Rockethub and Indiegogo have been launched. Plans to also create an Ebay donation page well on the way. One & only viewing of WTS’s official “alternate ending” teaser trailer to premiere at the worldwide premiere screening of “Raymond Did It” in Rockford Feb 11th. Auditions are planned for early March. More info coming soon. Still looking for crew to fill last slots.